We have actually made some changes in our newer versions of the game to add some more persistence to the game. 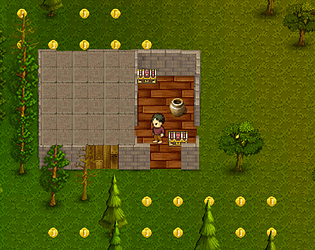 The landscape remains the same, but the animals, trees, coins, and other things spawned on top of it are procedurally generated each playthrough. It's interesting to compare this game with mine (Diversitizer). Both are endless landscapes. Rogue Infinity is obviously much more polished than Diversitizer and has actual (if simple) gameplay. I also noticed Rogue Infinity doesn't "remember" the generated world. If you walk one way and then back, the place you came from isn't the same anymore. This can be good or bad depending on what you aim for. For me, the world changing behind my back makes it feel less real and more prone to break suspension of disbelief, so in Diversitizer I made places always remain the same by using random hash functions for everything random, which use world coordinates as input. Of course, a constantly changing world can help shake up the gameplay.